Arbitration has been a way to resolve business disputes for centuries and is often a preferred method to resolve commercial disputes. Generally speaking, it involves the parties choosing a neutral third party (or parties) (the “arbitrator”) to address an equitable dispute resolution. Arbitration gives the parties the ability to choose the adjudicators to decide the dispute. There are also number of Illinois arbitration companies that can provide arbitration services. 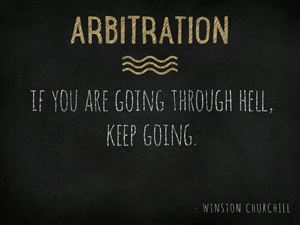 Arbitration provides the parties to a dispute a way to avoid litigation, which can be costly, time consuming and unpredictable and is non-public and can be confidential. While this method of dispute resolution is less formal, it still provides an opportunity for discovery, and can even be less costly and provide a speedy resolution. But this is not always the case. Like mediation, the parties can agree to arbitrate at the outset of any relationship by including an arbitration provision in their contract. The parties can also agree to arbitrate their dispute without any prior agreement and at any point in time, even after a lawsuit has been filed. Feel free to contact our Chicago law firm if you have agreed to or plan to arbitrate your dispute, or to discuss whether or not arbitration is an option for you to attempt to resolve your dispute.